Investment crowdfunding isn’t an idea born on Capitol Hill. It is an idea forged in the minds of entrepreneurs, a child of their own difficulties accessing capital. As Howard J. Leonhardt sat in the White House Rose Garden watching President Obama sign the JOBS Act into law on April 5, 2012, he was overwhelmed with a feeling of relief that future entrepreneurs may not be faced with the difficulties and the frustrations he faced in building his first company. One can’t understand why Leonhardt would say such a profound thing without first understanding his back story. 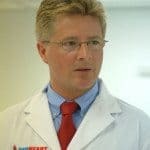 Beginning as a young entrepreneur, his story would eventually result in numerous medical breakthroughs and a series of new companies. It is also pockmarked with the all-too-familiar tales of regulatory hurdles, high costs and time wasted. His frustrations would lead him to lobby for passage of the JOBS Act. 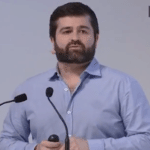 He’d later launch a venture fund, two accelerators and a stock exchange, eventually funding 28 companies and counting. In a way his story is the story of why the JOBS Act came to be in the first place, mirroring the experiences of Woodie Neiss, Jason Best and the other entrepreneurs that saw a need for radical change in the rules governing access to capital in the United States. What does a young mind with a great idea do when that idea would cost millions to bring to market? Leonhardt was faced with this question after attending the University of Florida. He founded his first company, World Medical Corp., in 1986. The goal: to bring revolutionary new biotech products to market, specifically products for treating cardiovascular conditions. The process of fundraising began. This is the first time he was faced with the regulatory realities of raising capital in the United States. He needed access to millionaires, but his upbringing in a largely blue collar neighborhood meant he didn’t know any. The average income of the households in his neighborhood was around $40,000. He would learn that regulations prevented him from soliciting investment from anyone he didn’t already know. After pitching his friends and family, Leonhardt had 35 investments of a thousand dollars each, no doubt a humbling vote of confidence from people without a lot of expendable cash in the coffers. Thanks to this new round of non-accredited investments in his company, legal fees doubled from $10,000 to $20,000, effectively skimming almost 30% of the money he had just raised from those closest to him; The money that he had promised would be put to good use. Feeling angry and betrayed by the system, he dreamed of going to Washington one day to fix things, but it would have to wait. He had a company to build. Things were going well and eventually Leonhardt realized that he needed a factory, but before he could get the factory he would need a million dollars to acquire it. It would take years to get the money he needed to expand. 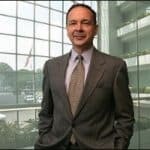 A manufacturing-focused spinoff of his original company, World Medical Manufacturing Company would eventually bring over 15 cardiovascular products to market including cardiovascular balloon catheters, percutaneous heart valves, intravascular lung catheter and the world’s leading aortic stent graft system – the TALENT (Taheri-Leonhardt) stent graft. Those 15 products were delayed years while Leonhardt tried to find ways to raise money. They would later be credited with saving as many as 200,000 lives. Death rates for associated cardiovascular diseases would be reduced from 90% to less than 1%. Eventually Leonhardt would shift focus to Bioheart Inc. Bioheart aimed to take World Medical Manufacturing’s progress a step further. A modified stent would be used as the delivery mechanism for Bioheart’s breakthrough treatment, a treatment that would use stem cells to help heal scar tissue of the heart. Leonhardt knew Medicare was spending $8 billion on heart failure drugs every year, and the drugs that did dominate the market left a lot to be desired. Quality of life for patients was generally poor. 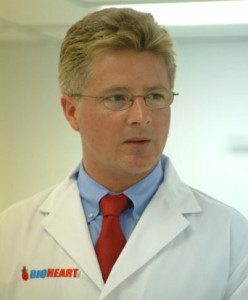 After years of research Bioheart’s method was ready for trials. Clinical trials would cost $7 million. The year was 2008 and the US economy was in a tailspin. Bioheart would go on to be the only biotech IPO in the United States that year, raising $6.5 million. Trials have shown cause for optimism. A one-half hour injection session of myoblast cells using technology from Bioheart Inc. delivers great results in a majority patients, and results tend to improve with subsequent injections. It could one day revolutionize how we treat heart failure in the United States and around the world. After the 2008 IPO, Leonhardt asked to see the tabulation of cost for the IPO. The total? $4.8 million, more than half of the $6.5 million raise. Today, Leonhardt is putting his experience to good use, traveling and evangelizing crowdfunding in his home state of California and beyond. He is planning a run for Lt. 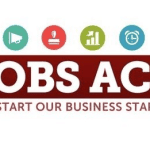 Governor of the State of California (a post with a heavy focus on economic development), and he is the state spokesperson for the JOBS Act and crowdfunding in California, a position he was asked to fill by Startup America Partnership. He also launched Leonhardt Ventures, a venture fund that has invested over $145 million in 28 companies to date. A logical extension of this venture fund was a small business accelerator. In 2008 Cal-X was launched. 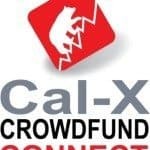 Cal-X’s top product at the moment is called “Cal-X Crowdfunding Connect,” which specializes in California Qualification by Permit offerings. These deals are available to residents and businesses of California. 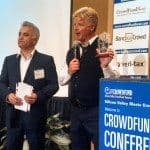 Investors must be accredited as defined by California securities law, so Cal-X is participating in equity crowdfunding right now as we wait for rules to come from the SEC. 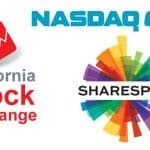 Cal-X Stars is the only 5 year business accelerator that is partnered with Cal-X The California Stock Exchange registering with the SEC with intent to serve as the leading U.S. exchange focused on serving smaller firms. 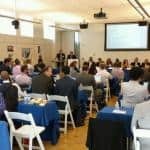 Cal-X Stars selects the best startups to be engaged in a full co-founder partnership with the goal to first get listed on Cal-X and later on NASDAQ or NYSE. 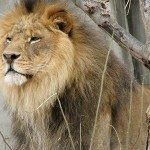 The exchange aims to break the walls down between CEO and investor. Leonhardt wants to place emphasis on the human aspect of businesses, the people that create them and the passion they have for their ideas. Cal-X is seeking a technology partner in an effort to license secure, effective trading software. They are also in the process of acquiring a space in San Francisco or LA. Wherever the market ends up, I wouldn’t bet on a Wall Street mailing address. 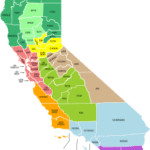 This entry was posted in Featured Headlines, General News and tagged cal-x, california, california stock exchange, howard leonhardt, startup america. Bookmark the permalink.